Menopausal brain fogs plague many women in their forties and fifties. “Brain fog” is a colloquial term for episodes of memory loss; during perimenopause, hormonal changes affect parts of the brain, like the cognitive functions, in ways that can obstruct short-term memory. Characterized by absentmindedness, difficulty concentrating, and struggling to take in new information and change to routine, memory loss has the potential to undermine a woman's confidence. Finding strategies to combat memory loss is the most effective way of dealing with its practical and emotional effects. Here are some tips. Keeping your mind agile and active is the key factor in preventing memory lapses. Consider taking up a new skill to keep your brain engaged and stimulated. When it comes to lifestyle changes, learning to play a musical instrument or speak a new language will not only help your memory, but it may also enhance your confidence and general happiness, too. Ginkgo has been used for centuries as a memory-enhancing herb, and there is some evidence today to support the use of ginkgo extract for reducing memory loss. It is thought that the herb exhibits properties that boost blood circulation to the brain to stimulate the cognitive functions and various neurotransmitters that control memory. Alternatively. Taking ginseng supplements could help; its active ingredients, thought to be ginsenosides, are said to improve abstract thinking and reaction times, two key characteristics of memory. 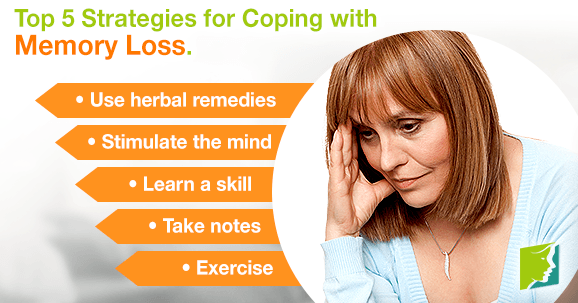 Menopausal memory loss can make processing, storing, and retrieving new information especially difficult. When receiving instructions, writing them down as you hear them will reinforce the information, making it more likely to sink in. This will also mean you do not have to ask for information to be repeated because you can refer to your notes later if necessary. Playing games that require prolonged thought, concentration, and engagement are an effective and enjoyable way to strengthen your memory. Try card games, board games, or word puzzles - such as crosswords - to stimulate your cognitive functions. Downloading a brain-training application to your mobile device could be a fun way to sharpen your cognitive functions, with the benefit of being conveniently accessible to use whenever you have a free moment, so you can avoid sitting around idly. Regular aerobic exercise has been found to significantly reduce the occurrence of memory lapses during menopause. Try to engage in some physical activity - whether this means going for a brisk walk, swimming, taking an aerobics class, or playing tennis with a friend - for at least 30 minutes, five days a week. One of the biggest problems with coping with memory loss is the fact it's a wholly internal symptom that is characterized by the woman's experience of it, without physical symptoms. This makes brain fogs easier to dismiss as imagined, unimportant, or inescapable. Remember, menopausal brain fogs are biological and real; likewise, they are treatable when you combat them with commitment, energy, and effort.